Follow mixing instructions on cake mix, except for when it says water, you add buttermilk. Pour into a 9x13 inch greased baking pan. Cook at 350 degrees for 25-28 min or until, you check with a toothpick and the center comes out clean. Let the cake cool completely. Step 2- crumble the cake into a large bowl, crumbs and all. 1 cup Nutella is then added to the cake crumbs, stir together with a spoon or your hands which ever is easier, until it is a thick consistency. 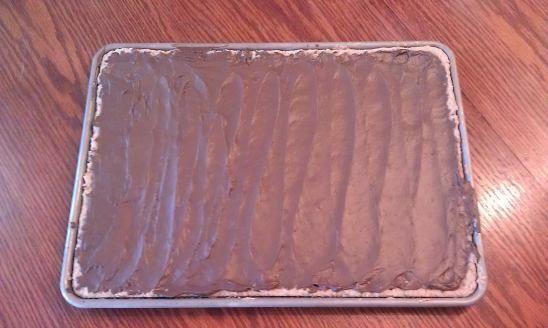 Step 3- I then spray a large cookie sheet with cooking spray, roll the cake into whatever size balls you would like. Lay them on the tray, and put them in the freezer for an 1-2 hours, or even overnight. Step 4- When they are frozen they can be stored in a freezer bag, to be finished at a later time, which is so nice. Pull them out of the freezer, dip them in dark or milk melting chocolate. Melt a little white melting chocolate, to either color or just drizzle on the top, to finish the look. 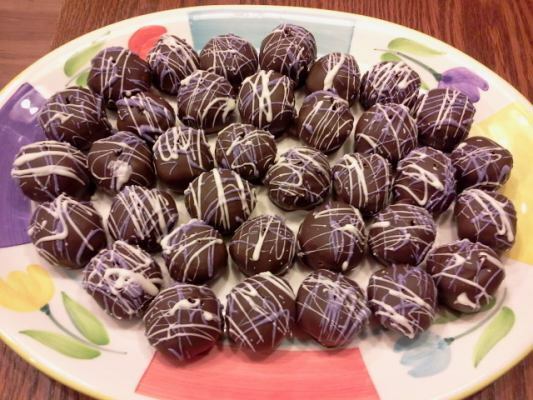 My family really loves these; I just make them, and store them in the freezer for a quick treat! My Gluten eating sister even requested them for Easter, kids and adults alike were enjoying these rich, chocolatey treats. These Peanut Butter Bars, taste just like the ones I used to eat as a child in grade school. 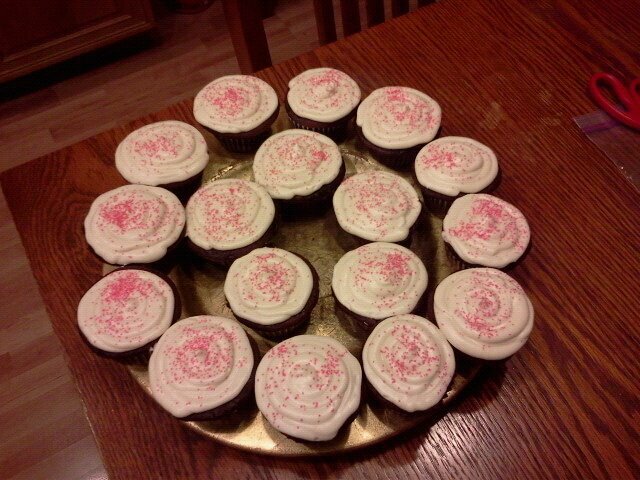 However; I am not a fan of cooked frosting, so all of my frosting is NEVER cooked! I know that is so weird, but I really love soft frosting, and my friends and family like thick frosting, so my recipe for frosting is pretty much by taste and consistency, not measurement. Combine with the ingredients from above, pat into a large cookie sheet. * Do not overcook, it will be light in color. Bake at 350 degrees for 18 min. dash of salt add milk to make it the consistency you like. These bars are chewy and delicious, they taste exactly like my mom used to make them.... with Gluten!!! So that makes me really happy, and my kids couldn't tell the difference. 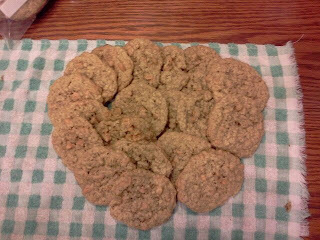 Thanks mom for such a great recipe, love you, Natalie!! 1- In a double boiler or microwave combine 3TBS butter, sweetened condensed milk, and chocolate chips, cook until they are all melted and mixed together. 2- Mix together sugar, butter, oatmeal, eggs, salt and Pamela's mix together. Divide this in half, press half in the bottom of large cookie sheet, that has been sprayed with Pam, then pour on chocolate mixture and sprinkle the rest of the dough mixture on top. 3- Bake at 350 degrees for 20-25 min, cool then serve. Well, I have now tried to make Texas Sheet Cake, Gluten Free twice; with 2 different recipes, and the only thing that has come from this experience is smoke and fire! My stove has been on fire both times, from the overflow of the cake and the cupcakes. 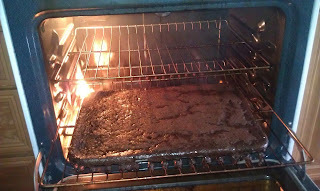 I don't think I will try that recipe again for awhile but, I do believe I have a brownie recipe almost perfected; it started the oven on fire again last night, but, the brownies are to die for!!! So as soon as I fix the overflow problem my good friend Paula, should be SO happy, she inspired me. Here is a picture of the burning cupcakes, and cake after math for your entertainment. 1- Mix all together, the batter is thick and doesn't over flow, so fill 2/3 full. 2- Bake 350 for 16-20 min, until the tooth pick comes out clean. 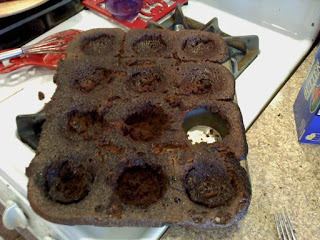 Make sure they are cool before you frost, they are super moist and will tear apart. 2-In a separate bowl, combine flour cinnamon and salt, then gradually add to the creamed mixture. Add the 2 eggs and mix well. Stir in the butterscotch chips. 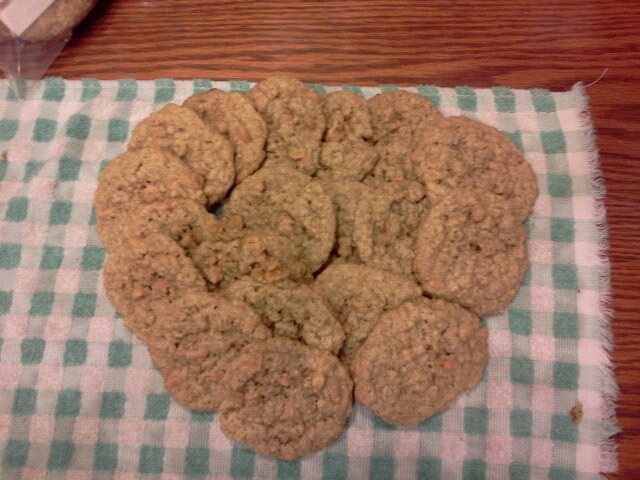 3-Bake at 375 degrees for 10-11 min, do not over cook, they will not be brown on top like regular gluten filled cookies. Brown edges are good. Let them cool for 1 minute on the pan, before transferring them to wire racks.